Arhar dal (Urdu name) also known as Split Pigeon Peas (or Toor Dal in Hindi) is a very popular and a great recipe for vegetarian. Lentils are part of the legume family. They contain high amounts of protein, fiber and healthy carbs, as well as minerals such as iron, copper and manganese. High fiber content Arhar Dal, is notorious for causing bloating, gas and heartburn, especially if you have a weakened digestive system. To prevent causing gas and acidity we usually add a pinch of asafoetida as asafetida has property to prevent bloating, gas and heartburn. However, like most beans Split Pigeon Peas contain sugars called alpha-galactosides, which belong to a group of carbs called FODMAPs. FODMAPs (fermentable oligo-, di-, mono-saccharides and polyols) are short-chain carbohydrates that escape digestion and are then fermented by gut bacteria in the colon. Gas is a byproduct of this process. Soaking and sprouting the beans is a good way to reduce the FODMAPs in beans. Changing the soaking water several times can also help. Note in the recipe we have completely removed the water in which we have soaked the Arhar dal and used fresh water to cook this Daal. For individuals with irritable bowel syndrome, gas formed during the fermentation process may cause major discomfort, with symptoms like bloating, flatulence, cramping and diarrhea. 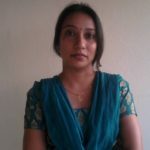 For healthy people, FODMAPs simply provide fuel for the beneficial digestive bacteria and should not cause any problems. Legumes such as toor dal are a healthy source of dietary fiber, which can help to prevent constipation too. Arhar dal is one of the most common dish that is made in homes on daily basis. 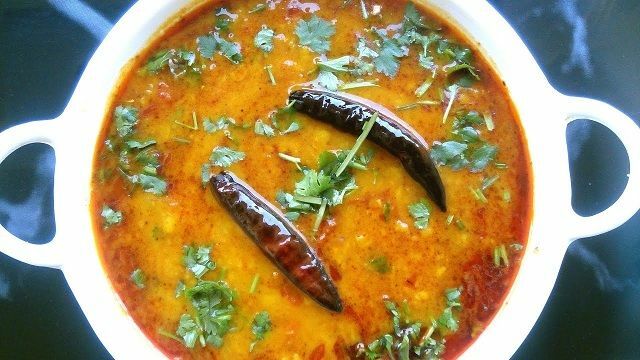 This dal is very nutritive and full of proteins. To make arhar dal more delecious it is seasoned with tomatoes, ginger, garlic and onions. Clean and wash arhar daal. Then soak the in 2 cups of water for 1 hour. Soaking the dal reduces the cooking time. For cooking the dal in pressure cooker firstly rinse the water from daal. Put the daal along with 3 cups of water, salt and turmeric powder in a pressure cooker. Close the lid put the weight and cook the dal on high flame. After the 1 whistle turn the heat to medium and cook for 4-5 whistle on medium flame. Turn off the flame and let it rest till pressure gets released. Once the pressure gets released open the lid and check if the dal is cooked or not. If the dal is thick then you can add some water to get the desired consistency. For cooking daal without pressure cooker drain out the water and boil dal with 5-6 cups of water, salt and turmeric powder in a pan over high flame. Once the dal starts to boil close the lid and turn the flame to medium. Simmer till the dal gets mushy. If the dal gets thick, adjust the water according to your desired consistency. Please note it takes around 45 minutes to 1 hour to cook daal in pan, while cooking it in pressure cooker takes 8-10 minutes only. To get uniform consistency of dal you can also mash it with masher too. Now, move the dal to a serving bowl and let's begin for tempering. To make dal fry - take ghee or clarified butter in a pan and heat it over medium flame. When the clarified butter is warm enough add a pinch of asafoetida, black mustard seeds and cumin seed. When the cumin seeds and begin to sputter add chopped garlic cloves, finely chopped ginger, green chilli, stir a little till garlic turns brown. Then add chopped onions, mix well and fry till onions turn translucent. Now add tomatoes to it, kashmiri red chili powder, coriander powder, garam masala powder, salt to taste and fry a little until tomatoes turn mushy. If the spices gets a little dry during frying add a little water to prevent spices from burning. Fry for 4-5 minutes, till the oil begins to separate. When the oil separates from spices pour it over the dal and quickly stir with a spoon to mix well. 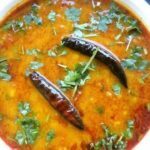 If the dal is thick then you can add some water to get the desired consistency and put to over medium flame to boil it once. Add 1 tablespoon clarified butter in a tarka pan. When the clarified butter starts to smoke add 1 whole red chilies. Switch off the flame and add a little kashmiri red chili powder in the pan. Remember to switch off and remove the tarka pan from flame before adding kashmiri red chili powder to it. Otherwise kashmiri red chili powder will get burnt. Pour this red chili tarka immediately over the dal. The beautiful red color of tarka adds divine look to this recipe. Before serving, garnish it with the fresh coriander leaves and a little lemon juice (optional). You can also make the same dal without onion and garlic, if you prefer.